Yesterday was looking like an epic day with cu's all over the place, but it was way too windy for safe flying, so most pilots waited until today to fly the still-awesome skies. It was a tossup between Mt. St. Benedict and Woodside, but given the amount of cloud to the north we opted for Woodside as it was in the clear and it looked like it could overdevelop in the Norrish Valley. Up on launch it was quite busy with a bunch of hang glider pilots setting up and Dennis just top-landing after his early flight. Vlad had tried to fly west with Igor already and got shot down on the crossing, so was back for flight #2. On glide to Green Hill. Cloudbase was already high (1600m over Woodside) and expected to go higher, and there were cu's in the middle of the valley, so Alex and I decided to fly to Bridal via Green Hill and the clouds that were forming over that mountain, and bypass Bear altogether. 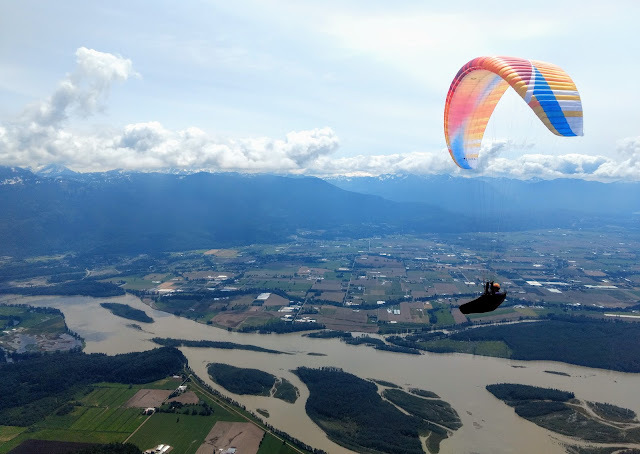 This also allowed us to stay high as we approached the Fraser River, as it it super-high still and the only possible place to land in the Ludwig area, if you don't make the crossing, is the highway exit triangle. We got a couple of nice climbs at Green Hill and then over to Ludwig, which was surprisingly "chunky" and a bit industrial. But over at the Lakes it was a completely different story...it was shady and hard to get up, I was stuck there for quite a while until I finally found something that got me to 1500m and enough to make it around the corner of Cheam and to the Bridal launch. On glide to Green Hill. Swollen Fraser River in the background! There were a couple of pilots on launch but it was still shady there (there was a lot of overhanging cloud) and it was a slow climb out until cloudbase, which was slowly rising and was at 1800m by now. But the day was getting better and better as the winds were still light and more sun was poking out on the Bridal side. Gloria was ON as I got to 1900m and it was an easy run to Elk and back, by which point I was looking at my options for crossing back to Woodside. Crossing back to Woodside from Archibald. 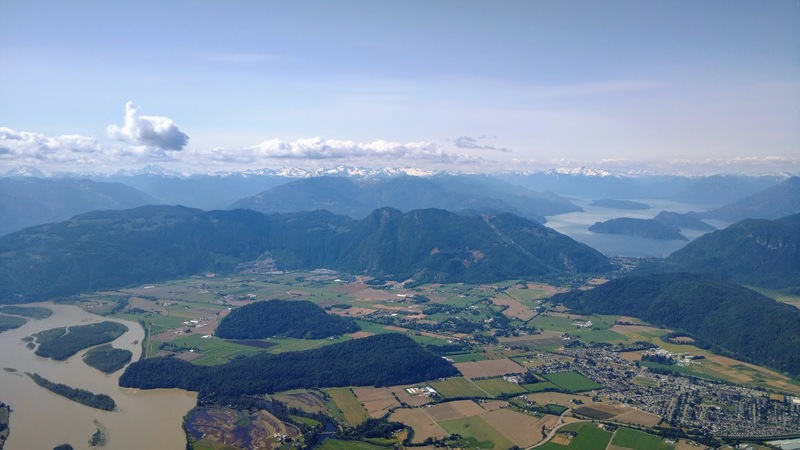 Alex had opted to run from Archibald and 2100m directly to Agassiz Mountain where he was able to climb out just outside the restricted airspace and get back to Woodside. 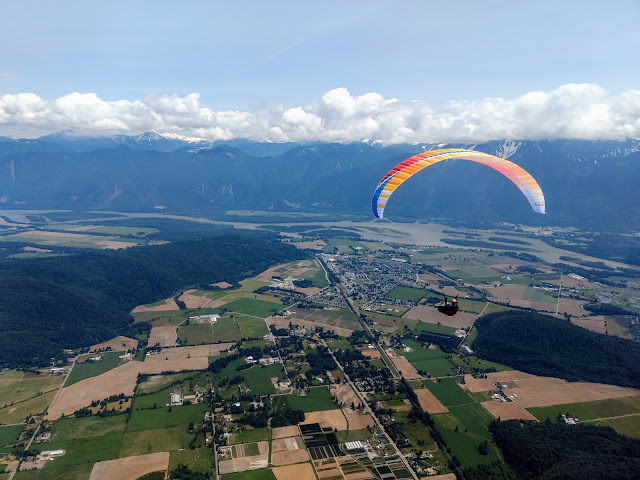 I had a worse glide...I wasn't feeling the love about reaching Agassiz Mountain legally (the Kent Prison CYR138 is below 1100') so I decided to land at Harvest Market with Mark Tulloch.